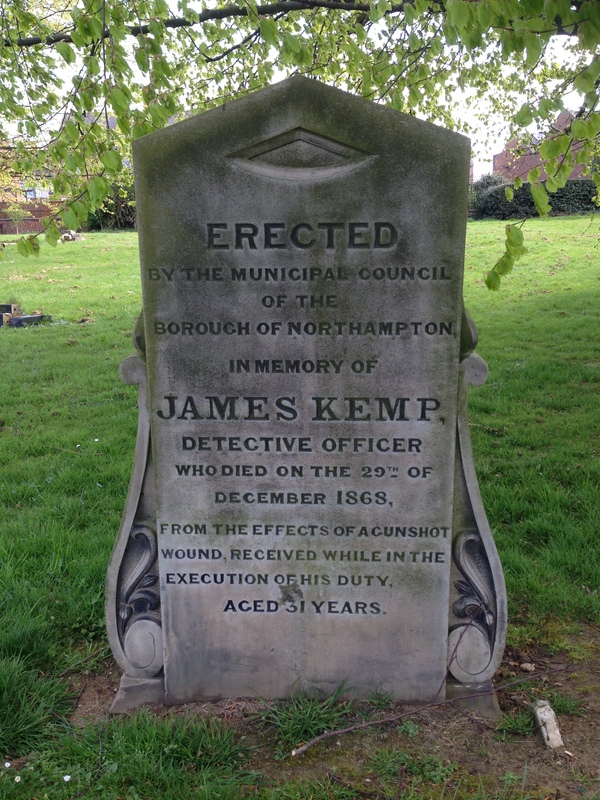 In 1868, James Kemp, an off duty Detective Sergeant with Northampton Borough Police, was called to deal with an armed man. He died on 29 December 1868, aged 31, as the result of a shotgun wound. He is memorialized as a British Officer who lost his life in the line of duty. A grave marker was erected in his memory in Billing Road Cemetery, Northampton, England, by the Municipal Council. 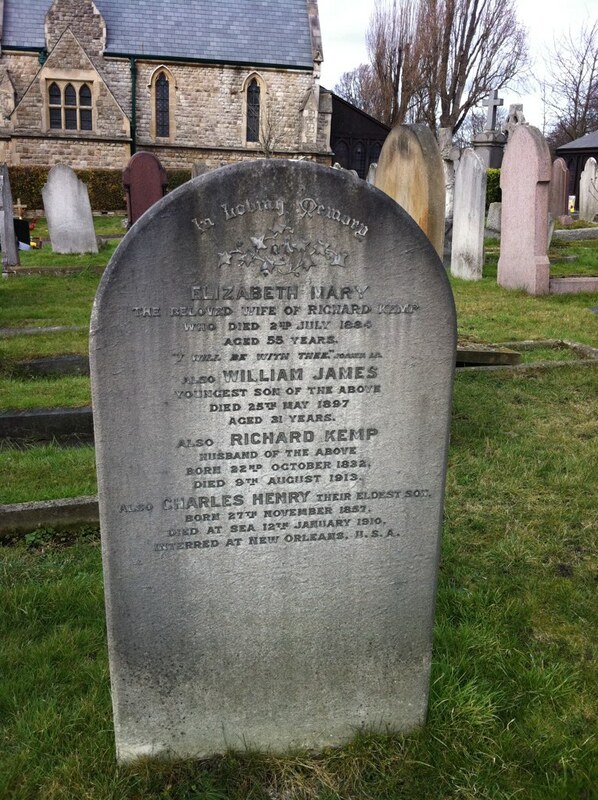 On 25 May 1897, aged 31, Detective Constable William James Kemp died from an internal hemorrhage aggravated by chasing a prisoner. He is buried in Wandsworth Cemetery, London, England. He shares a grave with his mother and father and his oldest brother who is memorialized on the stone having been interred in U.S.A. His mother was the first in the family to die and did not have to endure the loss of her sons. However, his father survived his wife and both of his sons. 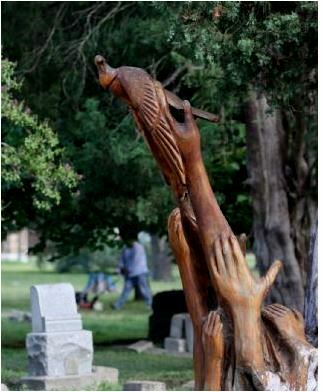 Aging trees, diseased trees, and trees destroyed by storms are receiving a new lease on life which is ironic in a cemetery. 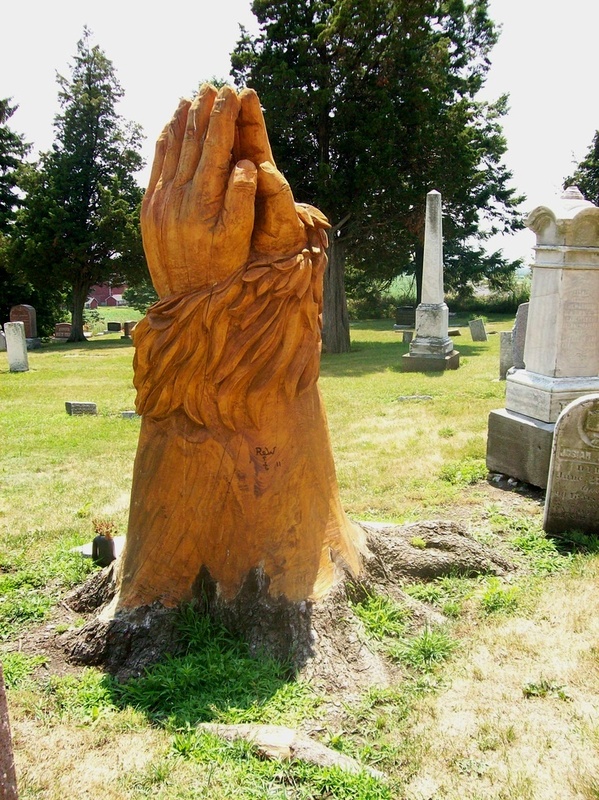 The majority of the carvings are done by chain saw with fine detail chiseled by hand. After completion the trees are coated with a protective sealant. 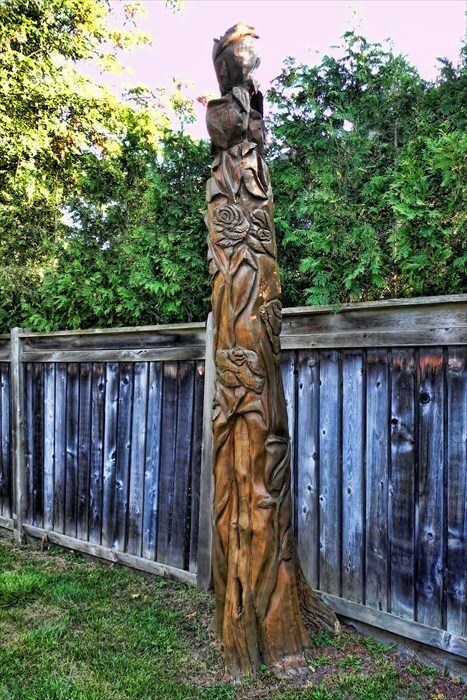 Most carvings are related to nature or belief in religion. The slave trade began as an exchange for British goods on the West Coast of Africa where African men, women and children were shipped directly to the colonies in the New World. 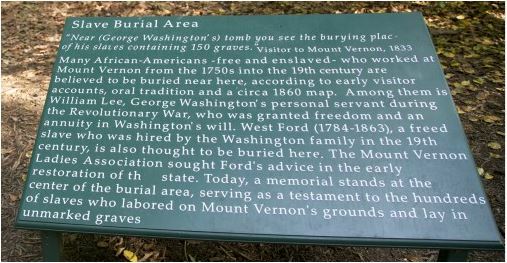 When slaves died, plantation owners refused to allow them to be buried on valuable land, and for that reason, black cemeteries are often found in marginal areas of fields or forests. Graves were randomly dug and marked with daily objects that the spirit might need. In the south, they were also decorated with seashells and pebbles. In North Carolina there are over 60 graves located at the edge of the woods in the Edwards-Franklin Cemetery. It was restored and dedicated by the Surry County Historical Society on 26 Aug 2010. During the dedication the names of 60 slaves found in historical records of the estate were read out. 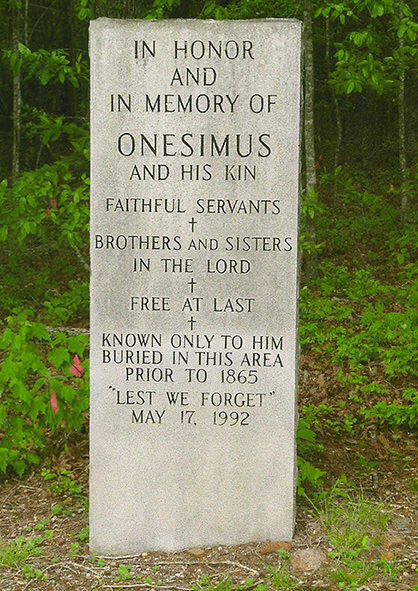 A white marble Monument in Sautee Nacoochee, Georgia, honors descendants of Onesimus a runaway slave, whom the apostle Paul received to the faith of Christ. The Monument was placed near the slave graves in 1992 as a joint project of the Bean Creek Baptist Church and the Nacoochee Methodist Church to honor those buried and unknown. 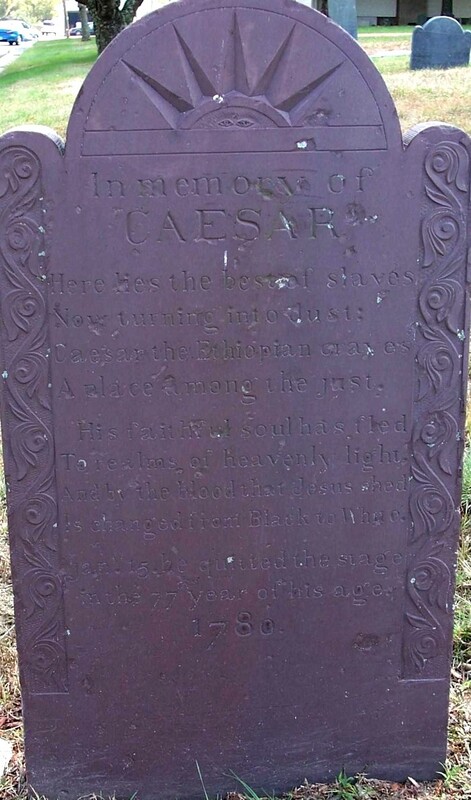 In Woodcock Cemetery, North Attleboro, Massachusetts is the grave of a slave named Caesar. In the 77 year of his age. 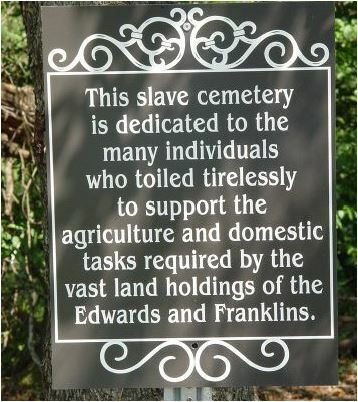 In Foxworth, Mississippi, is the grave of the world’s oldest man and last living slave. Reported to be 130 years old when he died, Sylvester MaGee claimed to have been a slave who fought for both sides in the Civil War. Although his claims are unverified, the county historical society memorialized him in the small churchyard of Pleasant Valley United Methodist Church. 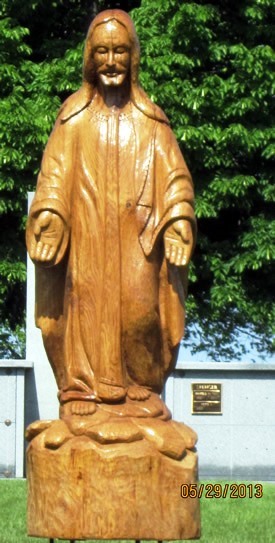 Believed to have been the last surviving American Slave, MaGee was born in Carpet, North Carolina, and sold at Enterprise, Mississippi, at the age of nineteen. He is believed to have served in the Civil War at both the Siege of Vicksburg and Champion’s Hill. Few records exist to support his life’s claim, yet some have stated that the detail and clarity with which he recounted his life’s experiences would have been impossible without having experienced it first-hand. Though he did not like to recount the worst of his days gone by, he made it known that his faith helped him make it through. 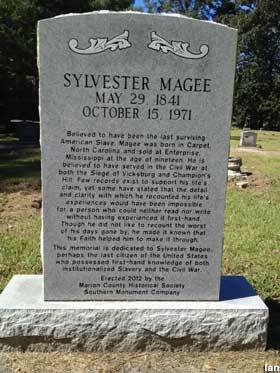 This memorial is dedicated to Sylvester MaGee, perhaps the last citizen of the United States who possessed first-hand knowledge of both institutionalized Slavery and the Civil War. 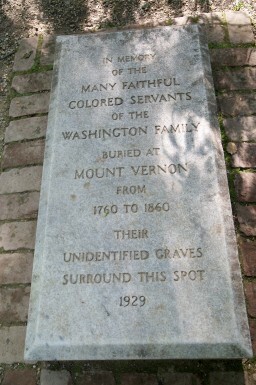 In Memory of the Many Faithful Colored Servants of the Washington Family, buried at Mount Vernon from 1760-1860. Their Unidentified Graves Surround This Spot 1929. 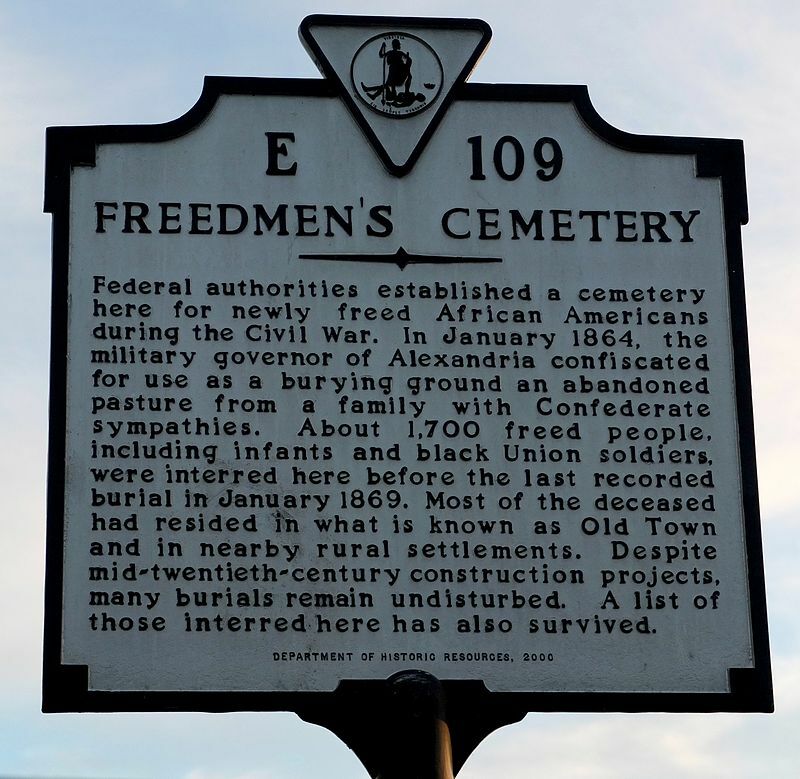 Listed on the U.S. National Register of Historic Places in August, 2012, the Contrabands and Freedman Cemetery is located at 1001 S. Washington St. in Alexandria, Virginia. Escaped slaves who were still the legal property of their masters were labeled as contrabands during the American Civil War and the military occupation of Alexandria. This classification prevented them from being returned to their masters and allowed them to work within the military in a variety of roles including soldiers and sailors. Approximately 10,000 black slaves were routed to Britain to become servants to entitled society. Scipio Africanus became a servant to the seventh Earl of Suffolk. Loved by the young Earl and his wife he was treated like a son and was buried in St Mary’s churchyard, Henbury near Bristol, England when he died in 1720 at age 18 years. 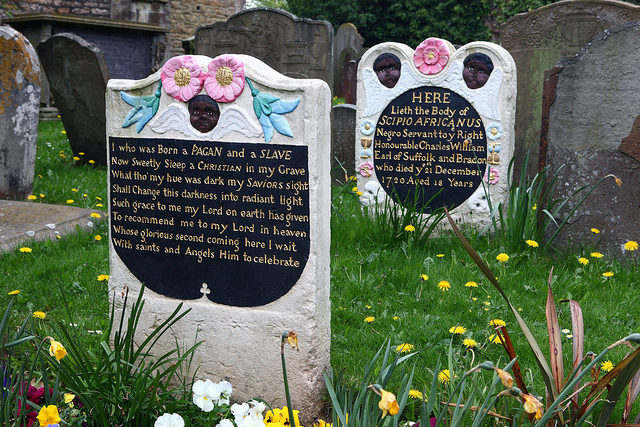 The gravesite is marked with a painted headstone and footstone with black winged effigies. With saints and Angels Him to celebrate. Some slaves did not survive the journey to new lands. This stone identifying Samboo is located near Glasson, Lancashire, England. 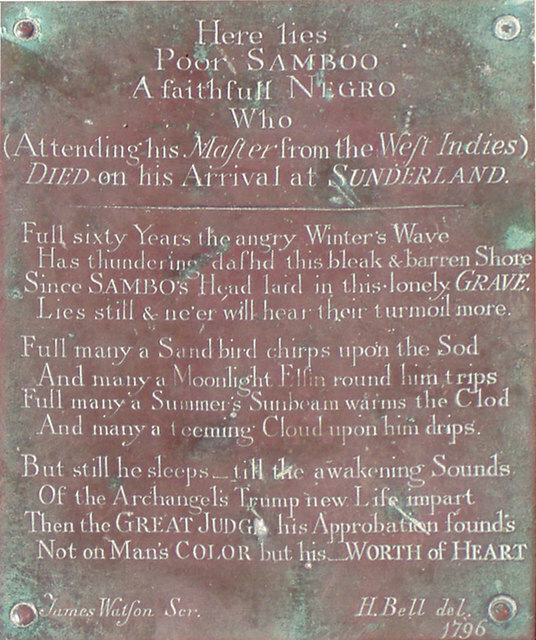 DIED on his Arrival at SUNDERLAND. Not on Man’s COLOUR but his – WORTH OF HEART.